We want to assure growers of a reliable source of bees at a reasonable cost while at the same time helping the beekeepers maintain a reasonable profit margin. Our services are designed to solve essential crop pollination problems for our growers. We maximize the pollination process of your crops by providing healthy, strong, and active hives at the BEGINNING of the bloom. 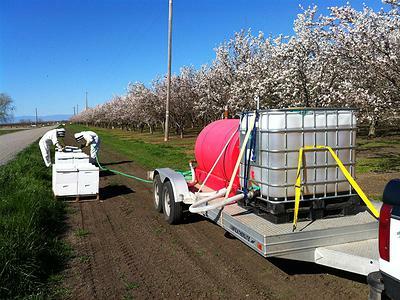 Hives are placed throughout your orchards in a pattern that assures the maximum distribution of pollinating bees. These services are accomplished at cost sensitive and competitive price levels with superior service. We provide two story “double deep” quality beehives. We pre-inspect the hives in our holding yards to help insure strength and quality. We provide a computer-generated topographic map to the grower showing placements of hives with an Excel Spreadsheet showing the average frame strength. We will correlate the arrival, weekly maintenance, and removal of the hives. We inspect the hives in the orchard as necessary. We act as liaison between grower and beekeeper. We negotiate a fair price for the rental of hives between the grower and the beekeeper. We have access to extra hives for emergencies. We provide a fair and equable written contract.